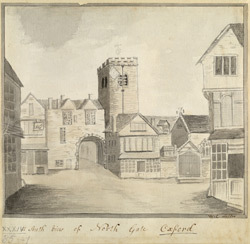 View of the north gate of the town walls of Oxford. Just inside the north entrance can be seen the ancient church of St Michael. This was built between AD1000 and 1050, just after the first city walls. Although only parts of the Saxon church survived a wholesale renovation in the 13th century, it remains a good example of pre-conquest architecture. Outside the north gate is the spot where 16th century Anglican bishops Cranmer, Latimer and Ridley were burned at the stake. The north gate was destroyed when the city walls were cleared away in 1771.